Pacific Northwest National Laboratory is studying how advanced building controls in energy-using equipment can reduce energy use and improve building operations. 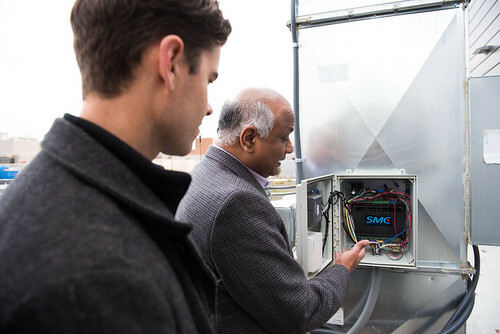 Shown here are PNNL researchers Srinivas Katipamula (right) and Nick Fernandez (left) examining a control box for a commercial building's heating and cooling system. Pacific Northwest National Laboratory is studying how advanced building controls in energy-using equipment can reduce energy use and improve building operations. 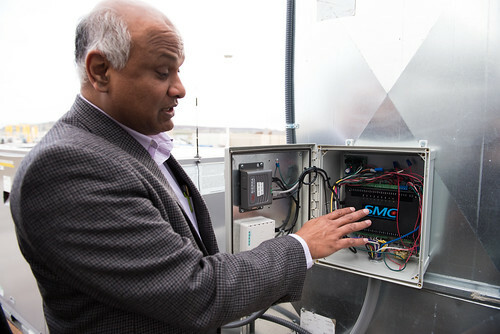 Shown here are PNNL researcher Srinivas Katipamula examining a control box for a commercial building's heating and cooling system. Pacific Northwest National Laboratory is studying how advanced building controls in energy-using equipment can reduce energy use and improve building operations. 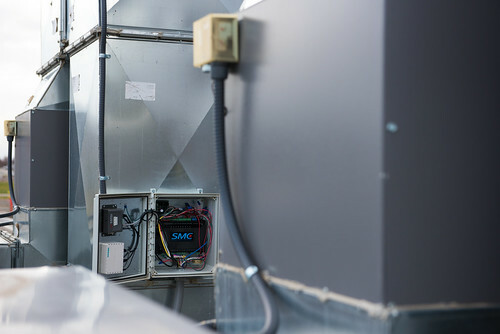 Shown here is a control box for a commercial building's heating and cooling system. RICHLAND, Wash. — Like driving a car despite a glowing check-engine light, large buildings often chug along without maintenance being performed on the building controls designed to keep them running smoothly. The Department of Energy's Office of Energy Efficiency and Renewable Energy funded this research. Reference: N. Fernandez, S. Katipamula, W. Wang, Y. Xie, M. Zhao, C. Corgin, "Impacts of Commercial Building Controls on Energy Savings and Peak Load Reduction," PNNL report to DOE, May 2017.